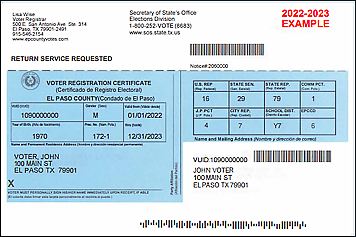 After you apply, a voter registration certificate (your proof of registration) will be mailed to you within 30 days. Check your certificate to be sure all information is correct. If there is a mistake, make corrections and return it to the Voter Registrar immediately. When you go to the polls to vote, present one of the seven (7) acceptable forms of photo ID. If you do not possess an acceptable form of photo identification and cannot reasonably obtain one, you may present a supporting form of ID (one of which is your valid voter registration certificate) and execute a Reasonable Impediment Declaration, noting your reasonable impediment to obtaining an acceptable form of photo identification, stating that the information contained in the declaration is true, that you are the same individual personally appearing at the polling place to sign the declaration, and that you face a reasonable impediment to procuring an acceptable form of photo identification. An election official will match your name to the official list of registered voters. For voters that applied for and received the permanent exemption from showing a photo ID based in their disability status, this status will be notated on their voter registration certificate. These voters are required to present their voter registration certificate when they go to the polls to vote. You will automatically receive a new certificate every two years if you haven’t moved from the address at which you are registered.